File your tax return by our deadline and we’ll give you 25% off! Just bring us all relevant tax data for the year, we’ll take care of it and have your tax refund deposited directly into your account. Contact us now by phone or email to get your questions answered and get started. At Beaton Accounting, we can handle any and all of your tax concerns, from individual or business tax returns to state tax credits and even pre-tax healthcare spending accounts. So what does that mean for you? No more forms lost in the mail. No more waiting in long lines to file your taxes. No more unanswered questions or confusion on any tax matter. When it comes to feeling at ease about your taxes, Beaton Accounting is dedicated to being there for you, whether you enlist our full services or simply consult our tax professionals. Get your maximum tax refund. We can tell you when you can expect your tax return and also let you know once it hits your bank account. Concerned about what to do differently now that you’ve purchased a home, gotten married, had a baby, etc…? Don’t worry, we’ll guide you through all of it with ease. We will help you file your tax return electronically so you get your tax refund as soon as possible. We’ll ensure you get email confirmation from the IRS once they’ve received your e-filed tax return. 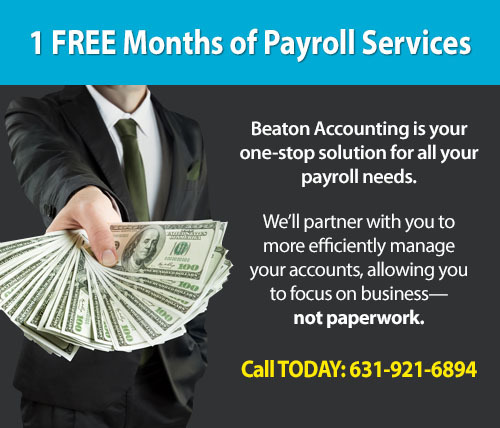 Going above and beyond for our clients is what makes Beaton Accounting more than just your tax preparer. We provide in-home tax preparation, so you can say goodbye to the hassle of waiting in line and hello to an easy refund! Plus, our tax return filing services typically cost 40% less than those of our competitors! We use the leading tax software and e-file both Federal & State returns to ensure accurate and speedy return processing. Filing your 1040 federal tax return using E-file software at no charge to you. Safe, secure and done. Filing your state tax return for any state in the USA plus any local tax returns. Forwarding your tax return to you for review and providing a bar graph to show your income changes of the past two tax years. Here are some of the things we’ll ask you about so we can help you get your maximum deductions and credits due. Did you sell stock or bonds last year? Do you own a rental property? Do you own a business? Are you a sole proprietor? Confused by the new healthcare law? We’ll make it easy. Give us a call at 631-921-6894. Don’t Forget: Corporate Returns are Due March 15th! If you’ve been paying some other tax preparer to file your business tax return, you’ve been overpaying. On average, Beaton Accounting’s tax preparation services cost about 40% LESS than other tax preparers’ rates! That means more money back in your business’s budget. 1120 & 1120S Corporate Returns – No hassle! All information is reviewed and analyzed for accuracy before being filed for you. 1065 Partnership Returns – Have a partner from an LLC? Let us file your 1065 return now and complete your business return for you and your partners. We do it all! Estate Returns – Received an inheritance and now you have to file forms? Consult our tax professionals to see how easy it can be. Take advantage of our Referral Program: Refer a business client and save BIG! Or request a FREE consultation instantly online here.